A very special birthday desk in mahogany, rosewood and curly maple. The squiggly quarter fans on the drawer faces and desk top were inspired by a bureau seen in the Bennington Museum that was made around 1820 in Windsor, Vermont. Pencil drawer and secret compartments. 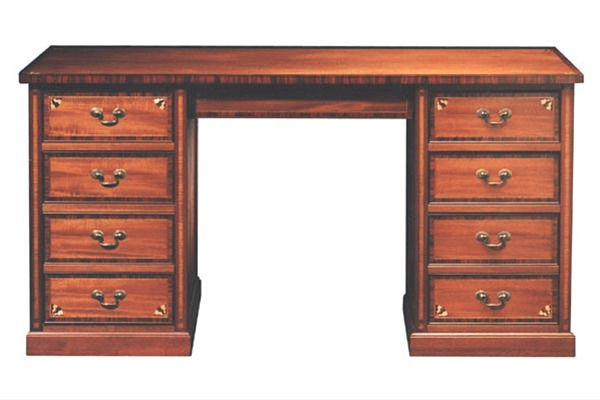 The desk details are drawn from American Federal era designs with contrasting woods and line details. Sides and back panels of the desk are similarly detailed with curly maple and rosewood borders. Overall, a complex and labor intensive piece. Bottom pairs of drawers are set up for hanging files. Custom variations available.